PARRY SOUND — Finally, some good news on Ontario’s largest forest fire front. 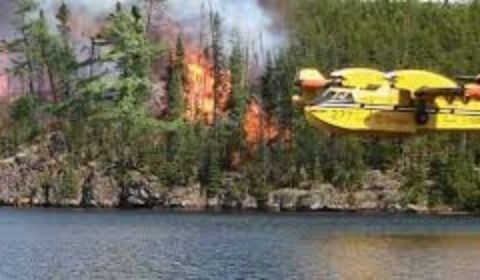 After three weeks of battling it from the air and ground, firefighters have succeeded in containing Parry Sound 33 to its current size for the past few days, and have upgraded its status as of noon Thursday. The status of the fire, which is approximately 11,362 hectares in size, has been changed from “not under control” to “being held.” And First Nations residents are being allowed home. Being held means that thanks to the ongoing work of firefighters, with water bomber and helicopter bucketing support, the fire is expected to stay within the control boundaries that fire crews have established. That’s thanks to 247 firefighters and support staff who are currently working on the massive blaze located north of Parry Sound and south of Sudbury. “This is great news, and I know Ontarians share my gratitude and respect for the fire crews and support staff who are battling this fire and other fires across the province,” Minister of Natural Resources and Forestry Jeff Yurek said. As a result of progress on Parry Sound 33, Henvey Inlet First Nation residents have returned home, and the Ministry of Natural Resources and Forestry is actively working with other communities and agency partners to determine when people can safely return to the area. Travel restrictions are still in place so the ministry asks that people stay alert and cooperate with emergency personnel. Please visit ontario.ca/forestfire to see maps and additional information. As of Thursday morning, there are 49 active forest fires across the Northeast — including a new Parry Sound 41. While only 0.4 hectares, it is officially deemed out of control. As noted above, Parry Sound 33, which remains at 11,362 hectares, is now being held. That’s according to fire specialist Shayne McCool, of the Ontario Ministry of Natural Resources and Forestry. He says, in Thursday’s daily bulletin, of the almost 50 fires, 17 are not yet under control, 32 are either being held, under control or being observed. FireRanger and Coastal Ranger crews are responding to 5 fires in the far north in proximity to the Fort Severn community. There are an additional 5 fires further from the community that are being observed to allow the ecological benefits of fire to occur. FireRangers from Ontario, Saskatchewan, Newfoundland and Labrador, and Mexico remain committed to this cluster, focusing primarily on North Bay Fire 72. Currently mapped at approx. 27,285 hectares. The fire has not grown in size in the last 2 weeks. Bucketing helicopters will be available and utilized as needed. The size of the fire remains at 11, 362 hectares. There was no growth yesterday. Aggressive fire suppression operations are ongoing throughout the entire fire area. There are 247 firefighters and support staff currently working on this incident. That number will continue to fluctuate with the state of the fire, as well as when staff complete their 14 day assignments and more staff become available after days of rest. Despite the fluctuation in staffing numbers, adequate staffing levels will be maintained for fire operations. The evacuation order issued by the Municipality of Killarney for residents in the areas of Travers, Allen, Struthers, Kilpatrick, Bigwood (including Hartley Bay Road), a portion of Mowat, the Unsurveyed Area, 14 Mile Island and French River Provincial Park still remains in effect. For information, call the municipality at 705-287-2424. McCool says the evacuation alert issued by the Municipality of French River for residents in the Alban area, west of the high powered hydro lines on Highway 64 is still in effect. For more information, call the municipality at 705-898-2294 or visit www.frenchriver.ca. For updates on highway conditions, including closures, please call 511. Ontario is receiving support from across Canada, the United States and Mexico to assist with the fire situation. A total of 469 firefighters and support staff are currently in the province. Alberta is providing personnel, equipment and aircraft. British Columbia is providing equipment. Newfoundland is providing personnel and equipment. Northwest Territories is providing personnel and equipment. Nova Scotia is providing equipment. New Brunswick is providing personnel. Prince Edward Island is providing personnel. Saskatchewan is providing personnel and equipment. Quebec is providing personnel and aircraft. Wisconsin, USA, is providing personnel. Parks Canada is providing personnel. Smoke may be noted in the community of Fort Severn in the Far North, due to active fires to the south and west of the community. Smoke from large fires across the region will be visible until fire activity is reduced and weather patterns change. Restricted fire zone expanded to additional parts of the Northeast fire region (southern region). Due to the extreme fire hazard, several recent periods of heavy lightning, little precipitation and increased forest fire activity, the Ministry of Natural Resources and Forestry has expanded the Restricted Fire Zone to include parts of the Southern Region of Ontario as outlined on the interactive map. This expansion of the current Restricted Fire Zone will be in effect as of 12:01 AM on July 24, and will remain in place until further notice. The expanded Restricted Fire Zone now includes Zones 24, 25, & 26 which would include areas south of the French River, including Parry Sound, from Georgian Bay east to the Quebec border, including Algonquin Provincial Park and from Renfrew north to Mattawa. To date, the current MNRF Restricted Fire Zone covers Zones 16, 17, 18, 19, 20, 21, 24, 25, & 26 and restrictions will remain in place until further notice. See the fire map for an outline of the zones covered. During a Restricted Fire Zone, the use of open fires – such as campfires, or burning of brush or debris is restricted. Failure to comply could result in fines of up to $25,000 and three months in jail, as well as financial responsibility for the costs incurred in fighting a forest fire. Portable gas or propane stoves are permitted for use for cooking or warmth, though they should be closely monitored. Portable charcoal BBQs and Hibachis are not permitted unless within 100 metres of a dwelling, or within an organized campground. Commercial campground operators may allow their guests to enjoy campfires during a Restricted Fire Zone period provided they meet certain conditions in the Outdoor Fires Regulation (207/96). The Restricted Fire Zone is a temporary measure to reduce the number of new human-caused wildfires as the Aviation Forest Fire and Emergency Services branch of the OMNRF expects the elevated forest fire hazard to continue into the foreseeable future.